But Canadian officials are warning that even liberal Canada has its limits amid concerns, fairly or not, that illegal migration is stretching the immigration system to a breaking point and risks stoking a potential backlash. Canada’s minister of immigration, Ahmed Hussen, himself a former refugee who moved to the country from Somalia when he was 16, said Canada was proud to be a welcoming country but could not welcome everyone. Only about 8 percent of Haitian migrants had received asylum here since the summer, he said, while there is a backlog of about 40,700 cases, according to Canada’s Immigration and Refugee Board. Canadian immigration officials are once again bracing for a possible influx of migrants heading north. On Monday, the Trump administration announced that it would not be renewing temporary protected status for nearly 200,000 Salvadorans, a humanitarian measure that had allowed them to live and work legally in the United States. On Thursday at a White House meeting, President Trump demanded to know why he should accept immigrants from Haiti and some countries in Africa, which he described in vulgar and disparaging terms. His remarks possibly further unsettled others in the United States already anxious about their precarious status. In what appeared to be an effort to dispel false hope among would-be immigrants and help stem an influx, Pablo Rodriguez, a Liberal member of Parliament who was born in Argentina, will be traveling to Los Angeles next week to meet with members of the Hispanic community there to explain the limits of Canadian asylum policy. Earlier this summer, the government also sent Emmanuel Dubourg, a Liberal Haitian-Canadian member of Parliament from Montreal, to Miami’s “Little Haiti” to spread the word that getting asylum in Canada was difficult. “People come here and realize that this is not the Promised Land and that they could be deported back to Haiti,” he said in an interview. In August, the number of asylum seekers who illegally crossed the United States border into Quebec swelled to 5,530, a majority of them Haitians, according to Canadian government data published that month. In November, that number dropped to about 1,500 people, suggesting that cold weather and the warnings from Canadian officials were having an effect. 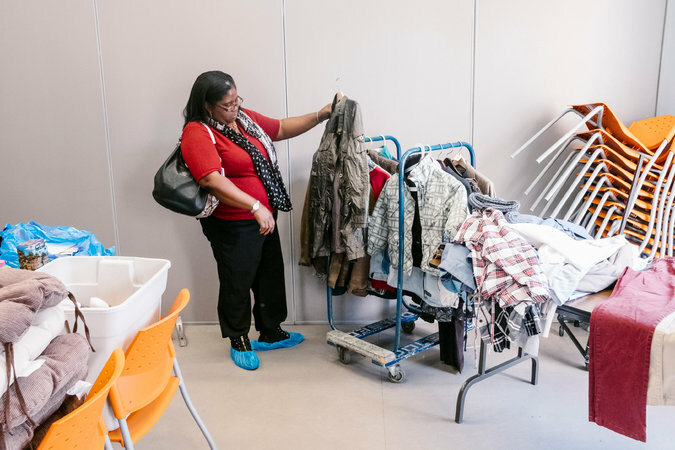 Ms. Beauville looking for clothes at a Haitian community center in Montreal. Many of those who travel to Canada avoid the official border, so they can circumvent the Safe Third Party Agreement between Canada and the United States, which requires asylum seekers to apply for refuge in the country where they first arrived. Mr. Hussen emphasized that Canada was obliged to honor its international commitments under the 1951 United Nations refugee convention, which makes clear that asylum claims should be considered even if those applying use irregular means to enter a country because refugees are, by definition, fleeing persecution. But experts say there are too few judges to adjudicate the backlog of refugee claims, which means that the asylum process for migrants like Ms. Beauville can drag on for as long as two years. Ms. Beauville is undeterred. She said that after her husband died 15 years ago in Haiti, his family threatened her with a machete unless she handed over her inheritance. So she fled to Long Island. There, she eked out a living as a caregiver. Life was not easy in America — she had left her young son with her sister back in Haiti — but at least it was better than living with death threats. When reports that Haitians were going to be deported from the United States began to circulate in the summer, Ms. Beauville once again packed her bags. She left her home in Long Island, boarded a Greyhound bus for Plattsburgh, N.Y., and then took a taxi to an unofficial point along the United States-Canadian border. Despite such sentiments, Marjorie Villefranche, the director general of La Maison d’Haiti in Montreal, a Haitian community organization, said the migrants had been largely embraced, in part because many Haitians speak French. She said that she did not know of a single case of a Haitian asylum seeker among the recent newcomers who had been deported from Canada, given that the appeal process was lengthy. And while racism exists, she said, much of the animus toward immigrants had been directed at Muslims. The center recently came under criticism, she noted, when it opened its doors to refugees during Ramadan. “The sad truth is that if Haitians were Muslim the reaction would be far different,” she said. Haitians began arriving in Quebec in the 1960s to flee the tyranny of François Duvalier, known as Papa Doc. Today, there is a Haitian member of Parliament, a senator as well as celebrated singers, Uber drivers and doctors. Ms. Beauville hopes to join their ranks, and on a recent day she and her friend Marie Nadege, a fellow migrant, made their way to Haiti House, where a Canadian canoe-making manufacturer had come to recruit workers. As far as they were concerned, Quebec was their new home. “I keep praying I can stay,” she said.